Up until last semester, I viewed science in one context- to learn science. I had never been exposed to the other spectrum- to do science. While we “did scientific experiments” in high school labs, it just felt like I was following instructions on cookbook. It wasn’t until I got to Duke that I actually felt like I was attempting to answer questions that hadn’t been asked before. This summer, I got to feel the satisfaction of not only asking interesting questions and even successfully answering one of them. This summer, I got to do science and nothing but science. Funny enough, it wasn’t the doing science that I will cherish the most about this summer. The most invaluable moments are the 20 minute weekly philosophical talks about science by mentor, Mariano. I would say one of the greatest lessons I learned this summer is that there is no capital T Truth; there are only many lowercase t truths that can suggest a capital T Truth. I knew about this saying, but getting a first hand experience of trying to reveal a truth cemented these words in me. I began to question not only if my truths were sufficient enough to infer about a Truth, but also if other things I thought were True were ever only true. I am a very trusting person, and before this summer, if you were to tell me something is science was True, I would probably shrug my shoulders and believe the Truth. Now, however, since there isn’t a Truth, I am able to critically think about whether there is even enough truths to even suggest a Truth. Another similar (almost depressing) lessons I learned about is the vastness of the unknown. In ecology, there is what happens in the lab, what happens out in the field, and what happens in nature. No matter how hard we try, there is just no way that we can simulate exactly what happens in nature in the lab or out in the field. This hangs over each researcher’s head, because there is just isn’t a way of knowing exactly what’s happening in nature. There is no way of even predicting how much of the unknown is there. This is a scary thought, but finding comfort in the vastness of the unknown is solace in and of itself. Honestly, I think I will remember these lessons more than the specifics about the inheritance of Arabidopsis thaliana. I guess I would kind of say I figured out that I not only loved doing science, but almost liked learning about the drawback even more. These lessons helps to put science in context of the natural environment, and I love nature all that more after realizing the breathtaking immenseness of its complexity. Thank you so much to Dr. Gurnwald and (future Dr.) Jason Long for allowing me to learn and do so much science. Thanks to the Donohue lab for being the kindest people. Although I won’t be continuing this lab during the semester (I realized I am more interested in the molecular side of things), I am beyond grateful for the experiences I have had. Also sorry for the title. I can’t help myself sometimes. Although every day in the lab is slightly different, there are some constants that exist. I usually get to lab and do germination checks for about two hours in the morning. I have my petri dishes where we put down 20 seeds in each dish, and I have to go through different cohorts each day and record the number of seeds in each dish that have germinated. Afterwards, I usually analyze the germination data from previous days using different statistical methods on R, or practice making different types of graphs. Sometimes I meet with my mentor to discuss different methods or if my interpretations of the results are valid. This usually brings us to a late lunch around 2, where I either nap for 20 minutes or quickly eat chicken nuggets at the Bryan center. After lunch, I do odd jobs around the lab for my lab manager for an hour. I usually help the other grad students in the lab in this time. These jobs include performing crosses between different ecotypes of Arabidopsis. Then it is time to check the plants that have been planted in the phytotron. This includes recording which plants have bolted, flowered etc. Occasionally we will water and fertilize the plants. We put sleeves/plastic cones on the plants that have started to develop so we can collect their seeds. We also make sure that the plants aren’t touching each other. After these checks, sometimes there are more germination checks to do, so I will do the final checks and leave. Can we really call the presentations last week a chalk talk? I would say it’s more like a Expo® manifesto. All (bad) jokes aside, I think the talks given were amazing. Everyone explained their projects extremely well, and I was surprised by the variety of biology topics presented. There wasn’t one project I wasn’t amazed by, and I am excited to in a cohort of such amazing individuals. One of the common themes was the world of epigenetic. As my project deals with these markers as well, I think a project that stood out to me was Michael’s “Differential Methylation of Shank 1 and DLG4 in THC exposed F0 -> F1 mice.” His project focuses on the transgenerational effects of THC on the methylation of the the Shank 1 and DLG4 genes. THC is found in marijuana, and the doses that he uses on the mice are relevant to the doses that an average user of marijuana consumed. The two genes he is focusing on are important in the post synapsis, so this project can help us to see if THC can cause harm on the gametes that are exposed to THC. He studies male mice gamete, because it is extremely painstaking to see the effects on the female gametes. He will expose mice to chemically relevant doses of THC and measure the effects on the methylation of the gametes by using pyrosequencing and rt-PCR. With the movements to legalize marijuana in the US, it’s important to assess the risks of the THC in it. Dr. Kathleen Donohue grew up in New Jersey, but moved to California to attend Stanford. Her family is in the arts field, and she was extremely interested in history and ecology. She loved putting the present in context with the past and was curious about the environment surrounding her, so ecology and evolutionary biology were a natural fit for her. Although Dr. Donohue was fascinated by science, it wasn’t until her undergraduate years that she realized she could express her love for this field thorough research. She completed her B.S., B.A. and M.S., before she went to the University of Chicago for her Ph.D. When asked about her experiences with teaching, Dr. Donohue says she loves the job. While she had no formal training, she expressed that she likes working with individuals in small groups and watching them grow. She wants her students to be more aware of the neighbors they are surrounding, and one time she gave a fun quiz to her class that challenged them to match a song to the bird. As much as she loves being a professor, Dr. Donohue also loves learning new things. Her most recent hobby has been glass shaping. Of course, she also loved hiking, biking and exploring the outdoors. Would it be blasphemous if an ecologist didn’t like nature? I also asked Dr. Donohue about the difference in interdisciplinary collaboration from when she initially started in research to now. To this, she said that biology has always allowed for lots of different fields to collaborate with each other, but she says most of these collaborations have yet cross the bridge between science and humanities. While Dr. Donohue loves the flexibility of biology which allows her to work with various colleagues, she said the hardest challenge she has faced in science is speaking up and voicing her ideas during seminars, group meetings etc. I can relate to her in that aspect, because I also have a hard time asserting my ideas in a group setting. One of the reasons I find my mentor extremely inspiring is due to her answer/lack of to the question of disasters in the lab. She struggled with an appropriate answer, because she said she doesn’t view anything as a disaster- just natural and another learning experience. Dr. Donohue recalled a field experiment that she spent hours setting up on the beach. Several minutes after the set up, the tide came in and washed away all of her seeds. Although her undergraduates were frustrated, she said just shrugged. She was studying seed dispersal and she just viewed it as nature’s answer to her question. I absolutely love her outlook on life, and can’t wait to spend more time getting to know more about her. This summer, I am working with my lab on an ongoing effort to answer the broad questions of how stable are transgenerational environmental effects and how do different genotypes affect this stability? We are studying the environmental effect of temperature on the development of Arabidopsis thaliana. To answer the question of how stable transgenerational environmental effects are (a.k.a does or to what extent does the effect of a plant’s ancestral environment depend on the present environment of the plant), we are monitoring 3 generations grown in two temperatures. To elaborate, the grandparental generation is grown in a warm and cool temperature, and offsprings of each respective environment are then also grown in warm and cool temperature to give 4 scenarios. Finally, for the last generation, we take the 4 different parentals and self-pollinate them to give 8 possible scenarios (CCC, CCW, CWC, CWW, WCC, WCW, WWC, WWW). Using data collected of key developmental marks such as seed germination, seedling traits, time and size of bolt, flowering time etc., we will be able to analyze if the effects of ancestral environments depends on the present environment of the plant. We answer the next question of the effects of genotype on transgenerational environmental effects by growing Arabidopsis Thaliana of various genotypes in strictly all warm or all cool climates for 3 generations (CCC or WWW). In both experiments we are testing plants that require vernalization (a cold period before they flower) versus those that do not require vernalization. This is a project that was started during the school year, so my portion is conducting the last generation for the two different experiments. I do germination assays (counting the number of germinants from each of the scenarios) and record specific phenotypes. Because plants take a while to grow, there is time where I’m not directly working on my portion of the project. During this time, I am learning about data analysis techniques for when the data becomes available. My mentor has recommended that I start to learn a bit of computer programming, so that we can analyze all aspects of the data. This portion is very statistic heavy, but I am very excited to explore biology through a quantitative lense. My journey into research has been one of immense serendipity. I came into Duke with tunnel vision- I was going into the medical field and that was it. I didn’t know labs existed on campus or that people conducted research as a profession. Honestly, I didn’t even know scientific articles existed until almost a year ago, much less ever read one. After a couple of happy accidents, however, I found myself in biology classes that required me to read scientific papers. In the beginning, I sucked. I would go to the basement of Lily and sit in a cubicle for hours, googling what seemed like every other word. (I still didn’t understand much). As the weeks progressed and more papers piled up, I don’t know why, but I slowly came to love the whole process. I started to analyze the methods a little bit more. I started to dig back into the authors past paper to try to grasp why and how the research question may have emerged. I started to think maybe I could even be a part of research. I merely mentioned this to my college advisor in passing, but I was very lucky and she offered me a place in her lab. So began my career in research, and the rest was history. Haha just kidding. I loved my previous lab, but because I am very new to research, I wanted to join B-SURF to discover the general topic I am the most compelled by. *Insert cliche about college being the time of your life to explore your heart out* *Insert another cliche about not being able to fully appreciate the light if you haven’t seen the dark yet* I previously worked in a fly lab, and the assays consisted of dissecting and immunostaining the larvae. Now, I work at a plant lab, and the assays consist of germinating plants and measuring plant phenotypes. 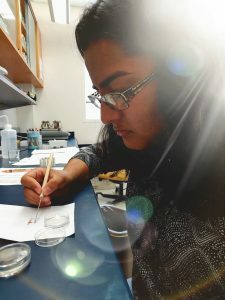 Each lab is unique, so I hope that through these experiences, I can gauge what type of research I am the most enthralled by. I think finding the specific topic or question I am interested in will be a lifelong process (or at least I hope it is, because questioning is always fun), but I hope to find a topic that I will be happy to study the ins and outs of during my time at Duke.